On the basis of more than 15 years�� production experience of our company, we absorb grinding mill technology advantages from the same field abroad and domestic, organizing elite powder processing experts to investigate, research, try again and again; finally, we develop this high-efficiency and low-cost SCM Series Super Thin Grinding Mill. SCM super fine mill is mainly applied to the powder processing of mineral products in industries of metallurgy, construction, chemistry, Fertilizer and mining etc. The grinding mill can produce powder from non-flammable and non-explosive mineral materials with Mohs hardness below 9 and humidity below 8%, such as barite, limestone, quartz, calcite, granite, porcelain clay, basalt, gypsum etc. 1. High efficiency. Under the same condition of finished particle size and power of motor, the output of thin grinding mill is 40% higher than airflow grinding mill and whisk grinding mill. 2. Environmental protection. 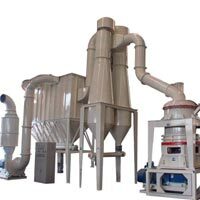 Pollution and noise are lightened by using deduster and muffler so as to reach the requirement of national environmental protection when using thin grinding mill. 3. High safety. No axle tree or bolt is used in the grinding chamber, so there will be no worn out problem of bearing and sealing parts, and also no loose of bolts in the running of thin grinding mill. 4. Finished size can reach to d97��5��m. 5. High using rate of spare parts. The main motor drives main axle and every layer rotating by the power of reducer. Dial drives numbers of rollers rolling and rotating in the ring by pintles. Big materials are crushed into small particles by hammer crusher. Then they are sent to store house by elevator. Vibrating feeder send the materials evenly to the middle of the upper dial. Under the function of the eccentricity, the materials fall into the ring to be pressed, crushed and milled into pieces by rollers. After the first crush, materials fall into the second and third layer. The pumping of the high-pressure centrifugal blower put the outside air into the grinding machine. The coarse powder will be brought into the classifier.